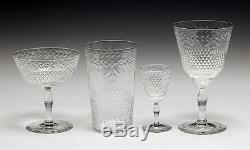 Description: Massive 32pc set of Kosta Cut Crystal Goblets / glassware / stemware, assortment - 9 Wine, 5 Champagne/Dessert, 9 Tumblers, 9 Sherry/Apertif. 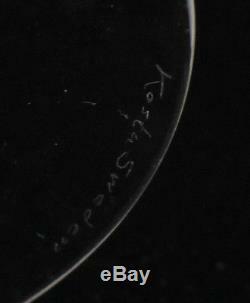 Some glasses marked'Kosta Sweden' some unmarked. Diamond pattern with berry and leaf detail. Wine 6.25" height x 3.5" diameter. Champagne/dessert 4.5" height x 4" diameter. Tumbler 5" height x 3" diameter. Sherry/Apertif 3.625" x 1.875" diameter. Please view our selection of quality items. For sale at Gallery XV! (This item is located in Gardena, CA). Domestic & International Customers - WELCOME! We guarantee the authenticity of all items to be as represented. We make a best effort to provide a fair and descriptive condition report. It's just the tip of the ice berg. We are prompt and professional with our correspondence and appreciate you taking the time to shop with us. "You are only as good as your last feedback". 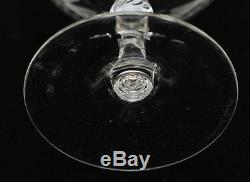 The item "32pc Kosta Cut Crystal Goblets, assorted Wine, champagne, tumbler, sherry" is in sale since Tuesday, May 13, 2014. This item is in the category "Pottery & Glass\Glass\Glassware\Cut Glass\Vintage". The seller is "gallery_xv" and is located in Gardena, California. This item can be shipped worldwide.